Yet another academic year has come and gone and with it a new class of Fashion students graduate. This year’s standard of BA collections was as high as ever, making it exceptionally hard to focus on key individuals. But we couldn’t help but be overly impressed, enthused and curious by a handful of students certainly set to take the industry in their stride… over to you Ellie Taylor. Ellie Taylor has the future in mind with her wonderful forward thinking outerwear looks, paving the way for a successful career. Northumbria University Design & Marketing students are briefed to create innovative brands that consider “out of the box” concepts: Terrain is Ellie’s approach to the brief. The performance ski-wear brand looks at the environmental and physical dangers of skiing. Taking inspiration from men’s dress shirting patterns Ellie aims to stress that you can take on any terrain with unconventional prints. The streamlined silhouette of the look coincides spectacularly with the high-vis fabrication used. What was the basic path that your research took to form your final concept? Did you go to any particularly inspiring exhibitions? Our first semester focused on research, looking at exhibitions, creating shop reports, analysing existing and past designers. During this term we were encouraged to draw to our hearts content. No matter how relevant it was to our final concept we were encouraged not to disregard it. 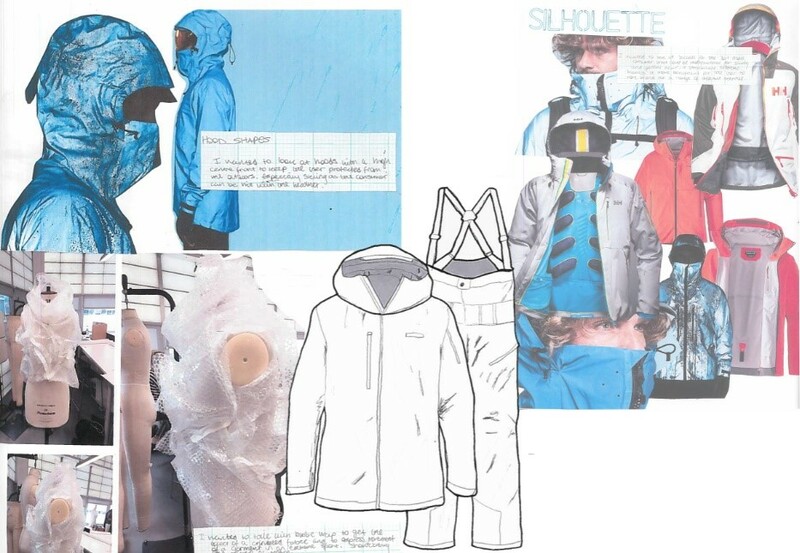 I really enjoyed collating all my drawings of existing ski garments as I could study the close details of the garments. The most inspiring exhibition I went to a Balenciaga exhibition at the V&A. Although their exhibition was very flamboyant, with their well-known ruffled and frilled looks centre stage, their iconic structured ski parka from their Fall 2016 ready to wear collection spoke to me, (mainly because I have a passion for outerwear), the sheer detail that went into garment and a unique structure to the coat. 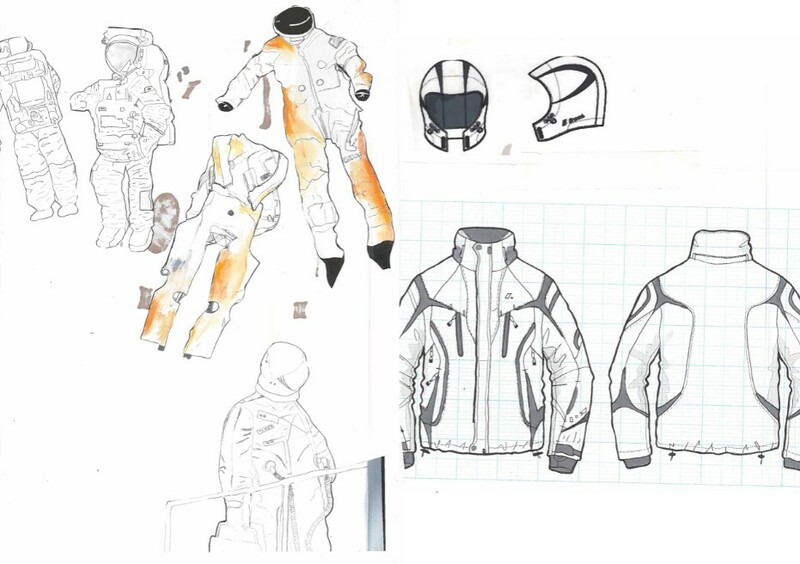 This reassured me that I could be as creative as I wanted pattern cutting my technical ski jacket. I was a chalet host on a ski season in Tignes before I went to university, so naturally I loved the outdoors, skiing, mountains and snow combined. I guess this is where my initial idea came from. All of my primary imagery was from my ski season. I began my research by looking at the soft natural colours of the setting against all the skiers and boarders in vibrant garments. I would say my initial idea came from studying imagery of ski resorts that were rather industrial and had a space age feel. Off The Cuff LDN love the link to men’s shirting patterns in your designs, what encouraged you to do that? During my research I looked at several decades of men’s wear to get an in-depth background of research. 1950s men’s dress shirts with classic blue and white pin stripes and checks and also subtle pops of colour intrigued me. I loved the formality that obviously dress shirts were used for and the idea of using the classic prints in a unusual/unconventional way i.e. ski wear. Did you specialise in any particular area? 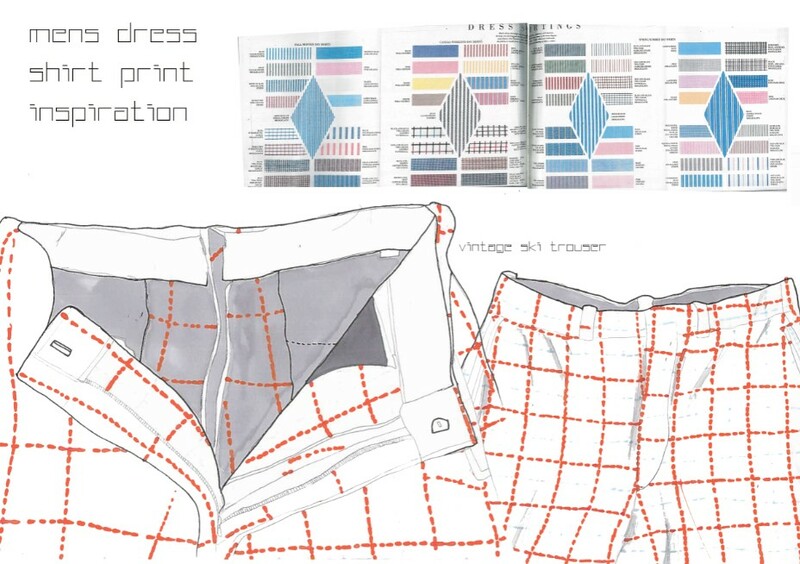 I specialised in pattern cutting, as I wanted to create technical outwear that was quite intricate with several pieces. I also chose to specialise in this area as I really enjoy pattern cutting: the detailing, the accuracy and how a flat piece can form a 3 dimensional garment. Did you placement year help decide your direction as a designer going into final year? Absolutely yes! I completed three placements over the course of the year in PR, Marketing and Trend. I learnt so much about so many aspects of the industry, and it really gave me a feel for what it entailed and what I really enjoyed. It is also fascinating, as I know I now want to embark on a career in design (which, I did not do on my industrial placement year). Working at a trend agency really gave me a passion for research as I could investigate and find out different angles to my project for an extended period of time. It also really helped me gain a lot of fabric knowledge, which, I think is crucial going into final year and creating a successful collection with fabrics that work together physically and aesthetically. What direction has this inspired you to take with your future career? My placement year inspired me to further look into research and menswear design. Therefore, I am embarking on a Masters Degree in Design. I gained so much experience in this area of the industry compared to other areas. After this I want to specialise in men’s technical outerwear. What fabrics did you use in your final looks? I used a combination of lightweight nylons (usually 2oz), particularly white as it was the focal colour of my concept and it was translucent so my prints were visible underneath. This created waterproof functionality, but also a frosted icy look, which adhered also to my concept. Developing prints with waterproofing over layers was a fun and interesting development process. I used clear plastic over a cotton digital print to give the fabric an interesting aesthetic, structure (from the stiff plastic) and waterproof function. I also used Highlight chemical fibre reflective cloth, commonly used in safety clothing. Due to my space themed research and concept, I wanted a futuristic look and also a variety of fabrics with different properties and ‘visibilities’. During the development stages I wanted to find a lightweight insulation for the collection. I experimented with a variety of samples such as batting wadding (a bamboo blend of 50% cotton and 50% bamboo). I ended up using thinsulate due to its high quality; soft texture and lightweight feel, which, I believed, allowed for a range of motion for the wearer and a streamlined silhouette. What was the biggest challenge in the creation of your looks? 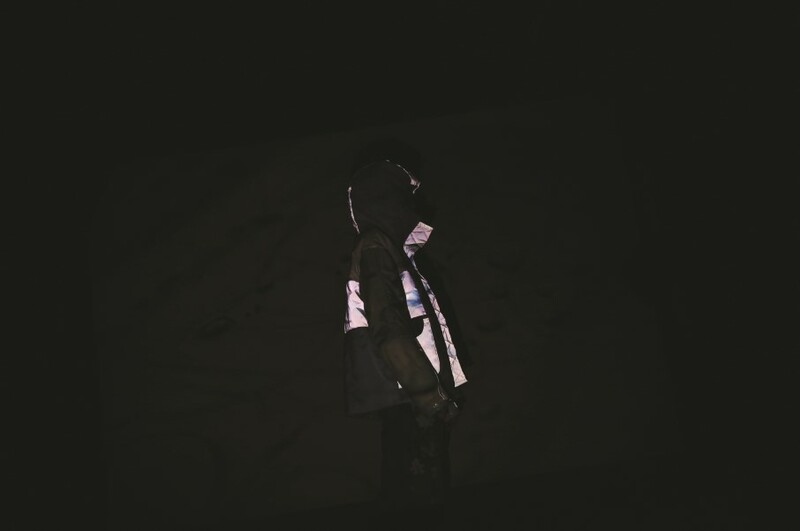 I believe the biggest challenge of creating my looks for my final project was trying to juggle different sections of each outerwear piece, (as there were a lot of stages,) i.e. the order of construction and dealing with a number of layers of fabric as one piece. 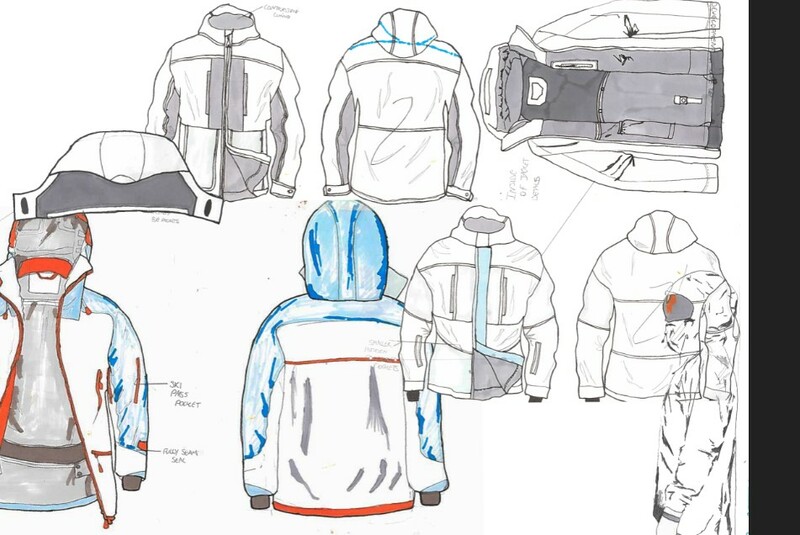 I also initially found it difficult to think beyond the boundaries of technical wear and to not create what was already out there in the market in regard to ski wear. This is where my creative inspiration of prints, fabrication and silhouette was developed with imaginative innovation.